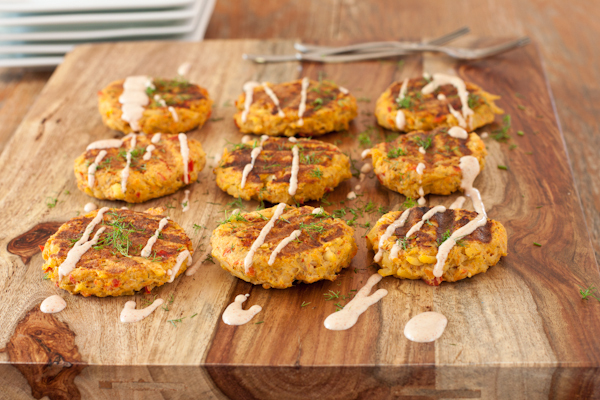 This is a new recipe I’ve been working on since going low-sodium, salmon potato cakes. I use Trader Joe’s canned Alaskan pink salmon with no salt added. 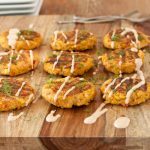 It took a lot of tweaking… I started out using my Mom’s thick fritter batter recipe (gluten-free, of course), and evolved into a grain-free patty with the focus on the fish. Carrots and red pepper help make it a complete meal, should you decide to forgo eating anything else. I would serve these with a side salad. I used frozen Ore-Ida hash browns (which are super low-sodium, but do contain a little dextrose to keep them from browning), making this truly quick to throw together. Of course you can quickly grate your own potato instead. If you don’t eat white potatoes, grated sweet potatoes would probably be a wonderful stand-in, especially if you’re strictly on the paleo diet. After trying these in a frying pan, I finally pulled out my new George Foreman grill, which cooked them perfectly in five minutes, adding lovely grill marks on both sides. Super easy, and quick to clean up too, because the new model I have has removable grill plates. It’s much easier to clean than our old Foreman grill, which I still loved anyway. We’ll be giving away a new Foreman grill at the end of the month, so stay tuned! Tasty little cakes, burger-sized or appetizer-sized. Drain the salmon and flake it into a large mixing bowl. Measure and add the potatoes. Put the carrot in the food processor and pulse until roughly chopped. Add the red bell pepper and pulse until both are fairly finely chopped, but do not overwork it. Add the carrot, bell pepper, and remaining ingredients to the bowl and mix with a spatula until evenly distributed. Preheat the Foreman grill, grill pan, or non-stick frying pan. Use the spatula to smoosh everything together, so that the potato starch and the flax seeds make it very sticky. Use a measuring cup, egg ring, or ice cream scoop to portion out the patties evenly. Cook for five minutes per side. Top with Joe's Mustard sauce or another creamy sauce and fresh dill if available. Get monthly updates from me on new posts, special offers, and speaking engagements. 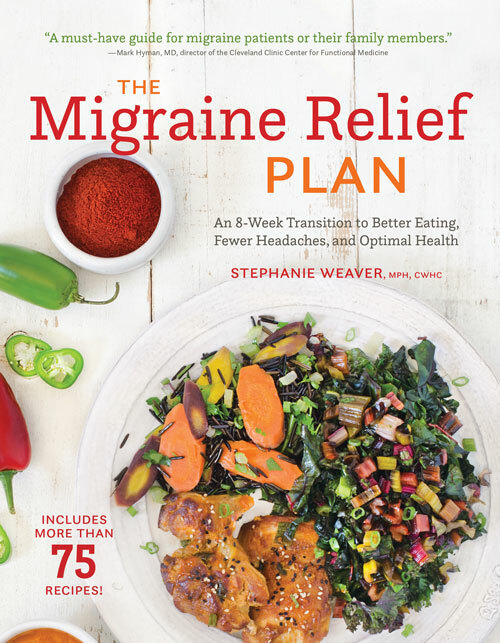 Not spammy, plus you get a FREE Migraine Relief Plan Travel Guide for signing up. Made this for my friends before the excesses of the season ramped up and served it on a bed of arugula with a yogurt mustard sauce and we all loved it. Do I have to cook the potatos first? Just grate? And add to the recipe? Jessi, you can definitely just mince the ingredients by hand, and use a non-stick frying pan for these. And yes, smoosh is very technical. Enjoy! Am I just weird or do you pick out the bones in the canned salmon? I haven’t converted yet to the canned stuff because of things like that… I am intrigued by the ingredients in this though! These sound so tasty and I am tempted to make them! Hi Lynn, what a great question. The Trader Joe’s canned salmon does not have bones. It’s usually listed on the label. Some people eat the bones for the calcium. I don’t, so yes, if the canned salmon included bones I would pick it out before making the cakes. Let me know if you try it!